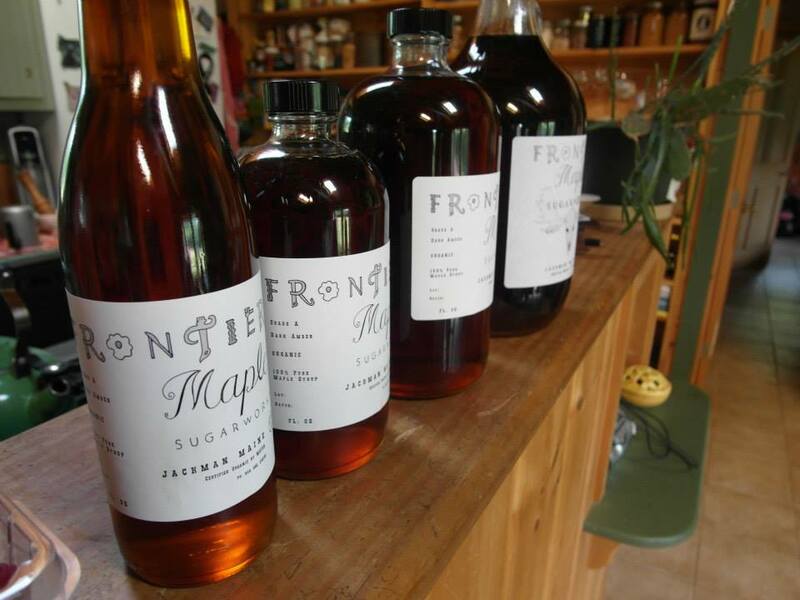 Frontier Maple Sugarworks began in October 2011, when VJ secured a lease on 200 acres of state land in Sandy Bay Township. Our name, which refers to our location on the remote western border of Maine, is also a homage to our favorite breakfast destination in the world, Albuquerque's Frontier Restaurant. It seems an apt title for our enterprise because of the rustic skill-set sugaring work demands, because we're on the frontiers of the industry, and because we have embraced the frontiersman's spirit of "making do". VJ grew up in NH and started to work for various sugarmakers in Starksboro, VT when he was twenty. While working as a furniture and cabinet maker, he always tried to get sugaring work whenever shop work slowed down. When VJ and Carrie met in 2002, Carrie was co-founder of Bennington College's sugaring club and her friend, Dana, was writing her senior thesis on local sugarmakers. Coincidentally, VJ had recently graduated from Saint Michael's College, where he wrote a business plan for a sustainable woodlot which included a sugarbush component. In 2005, VJ, Carrie, and Dana pieced together a hobby operation - first boiling sap outdoors under a modified stainless steel lab sink. We shared some vivid nights hanging out under the stars watching sap boil. We each had matching sticky patches on our parkas that year from hauling "sweet" up the hill to VJ's off-the-grid camp in five-gallon buckets. Through boiling sap collected from 600 taps that VJ handshake-leased from a friend the following year, he gained the experience of running a small sugarhouse on his own during the 2006 season. When we left for Montana in 2007, we had a final breakfast with Dana on the deck at the camp. It was a sad time, but it was sweetened a bit by the puddles of homemade syrup that soaked our pancakes. Maybe because we literally left Vermont with the taste of maple in our mouths, when we returned to New England a few years later, we were eager to open our own sugarbush. Easier said than done. Even after VJ won the lease in Jackman, it took us three years to find funding to build our sugarhouse and install equipment for boiling onsite, and we did everything on a shoestring. Thanks to Coastal Enterprises, Inc, and to Carla Booth's relentless advocacy, we were able to secure funding the non-profit and community-based way. (They are a great asset to Maine.) In the meantime, from 2011-2013, we collected and sold sap and kept expanding our network of tubing and trails in the woods. Then, in June of 2013, we began the sugarhouse site construction. VJ and his uncle excavated a site not far from the original vacuum shed and sap tank. Thanks to Steve and Leah at Shaker Mountain Maple Farm in Starksboro, VT, VJ borrowed (and ultimately purchased for the business) the first evaporator he ever fired. Once the drains were set and the slab was poured, we moved the evaporator by crane to the sugarhouse site, where it sat under a good four feet of snow as the roof and walls went up incrementally around it. Some memorable moments: The night the Rhino shelter collapsed under snow and ice after a big storm. VJ roofing in the wind. Constantly fixing broken snowmobiles in negative temperatures. Hours spent chipping ice off the slab with a mattock, ice fishing chisel, and pry bar. We were in a race against time and for a while there it was seeming pretty dire. The "polar vortex" worked in our favor, though, postponing the spring thaw long enough for VJ to get the vacuum pump and Reverse Osmosis machine plumbed in and the rest of the tapping done. At some point the sun started shining, the sap started running, and we were making syrup. We remembered how much we love boiling, especially the spring smell of maple steam - which is both vanillian like a baking cake and earthy like mud season. We watched sap flow into the tanks, its movement cheerful, steady. This first season's final accounting? 14 barrels of Somerset County's finest certified organic maple syrup, now available for purchase in lovely glass containers.